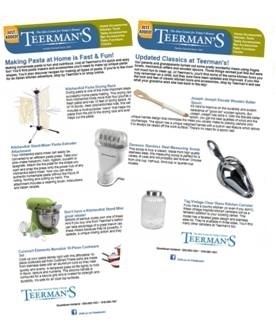 When you sign up for the Teerman's email newsletter you get news and information on new products we've added - in the store and online. We usually send them out once a week and feature new products for cooking, baking, home decorating and furnishing. You also get advance notice of sales and in-store demonstrations. Of course we will never share your email address with any other business and you can cancel your subscription whenever you want. Just fill out the box below and start getting your email newsletter!